Last summer, the University of California published a study that found that babies whose moms lived within a mile of crops treated with widely used pesticides were more likely to develop autism. This weekend, as we researched what organic fertilizer to buy to help our new backyard and garden, I was reminded of this study, and it resonated. Especially as I saw how much fun my boys were having rolling around in the grass and touching the plants and dirt in the new garden. As described in the study, approximately 200 million pounds of active pesticide ingredients are applied throughout California each year (this number is actually much larger since this figure excludes pesticides used for home-and-garden use and most industrial and institutional uses- which would add a large sum to the total). Certain commonly used pesticides have been associated with abnormal and impaired neurodevelopment in children, including autism spectrum disorders (ASD). While the exact cause of autism has not been uncovered, most scientists agree that environmental factors can contribute strongly to risk. Children born to mothers who had lived within a mile of fields treated with pesticides were 60 percent more likely to have an ASD than children of non-exposed mothers. Organophosphates pesticides showed the strongest links, but other pesticides, including pyrethroid insecticides, also showed strong links with autism (ASD). How the women were exposed to pesticides, whether air or consumed through water or food was not determined. Because the study only looked at physical proximity to agricultural pesticides exposure it DID NOT take into account many other potential sources of exposure to these chemicals, including: nonagricultural sources (e.g., institutional use, such as around schools); residential indoor use; pesticide application for gardening, landscaping or other pest control; and dietary sources. WHAT'S NEW ABOUT THESE FINDINGS? WE already knew that prenatal exposure (to pesticides) is associated with lower IQ, but this study suggests that mothers’ exposures during pregnancy may play a role in the development, specifically, of autism spectrum disorders. It also strengthens the evidence linking neurodevelopmental disorders specifically with organophosphates, and provides novel results of ASD with, pyrethroids. Application of pyrethroids just prior to conception meant an increased risk of 82 percent, and during the third trimester, the risk was 87 percent higher. This is of special concern since pyrethroids were supposed to be less toxic than organophosphates and have thus increased in popularity in recent years, both on farms and in the home, due to bans of other insecticides. IF I DONT LIVE IN A AGRICULTURE COMMUNITY DOES THIS AFFECT ME? Yes. This study strengthens the realization that pesticides should be avoided, even in small quantities, especially if you are pregnant or have young children. While families living near agricultural land being sprayed with pesticides are exposed to these chemicals at a larger scale, many families are inadvertently exposing themselves and their young children to these same pesticides on a daily basis too. IN YOUR BACKYARD: avoid using pesticides in your garden or lawn. This is especially important if you are thinking of getting pregnant, are already pregnant, or have small children rolling around in the lawn. The National Academy of Sciences reports that 50 percent of contact with pesticides occurs within the first five years of life. 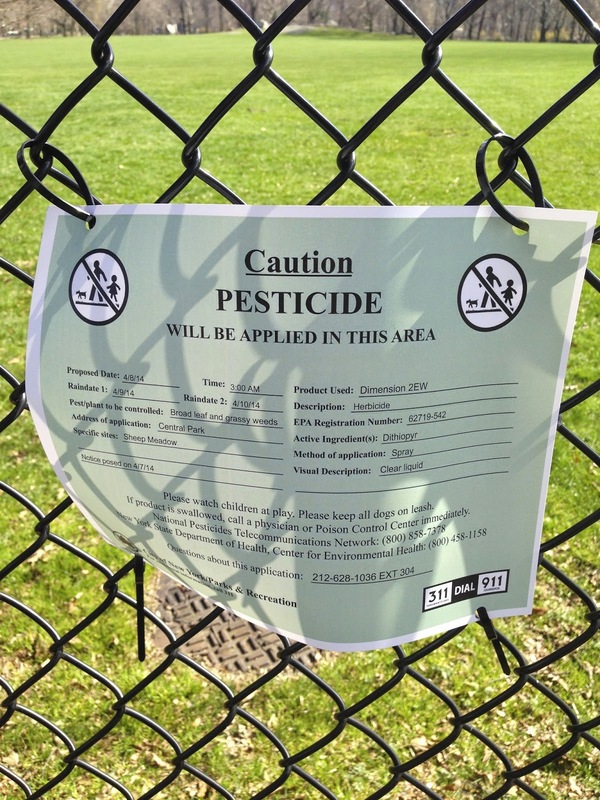 might see signs that warn of pesticide use which can be harmful to children and pets. I will repeat: 50 percent of contact with pesticides occurs within the first five years of life. - If the sign says the park has recently been sprayed, avoid playing there for some time. - Every time you leave a park it is always a good idea to wash little hands with soap and water thoroughly. - Another good practice? Take your shoes off when you get home. Every time you walk around your house with shoes on you are spreading traces of, among other things, pesticides you might have stepped on, throughout your house. This is especially problematic if you have small children who love to play or crawl on the floor. ROACH OR OTHER INSECT PROBLEMS: Instead of spraying for cockroaches or other insects with products that contain these toxic pesticides, try integrated pest management which starts by sealing up cracks and crevices in the home first, cleaning up food residue and trying relatively non-toxic options. FOOD: When possible choose organic fruits and vegetables. Always thoroughly wash your produce before eating. to remove certain pesticides and bacteria from your fresh produce. (for most fruit, excluding porous berries I recommend you mix 10% white vinegar to 90 percent water as a bath to briefly soak produce. Excellent and natural way to remove pesticides and bacteria from your fruits and veggies). Remember, this study is not saying that being exposed to pesticides alone will give your child autism. The risks reported in the study, most scientists can agree, pale in comparison to some hereditary factors, but are comparable to other risks for autism, such as advanced parental age or not taking prenatal vitamins.
" In California alone, autism diagnoses were up 600 percent between 1990 and 2001. Yet researchers found that only about one-third of the rise could be explained by changing diagnoses or kids being diagnosed at increasingly younger ages. Some experts suggest that environmental exposures may also be contributing to the climbing rates. Some studies are starting to look how environmental exposures may act differently in people whose genetics make them more susceptible. Next, this study's author hopes to look for autism risk from pesticide exposure among mothers with certain genetic variations. “We need to know if some moms are at higher risk than others and what that risk is. Knowing who is most vulnerable is key to understanding how to better protect them,” she said.